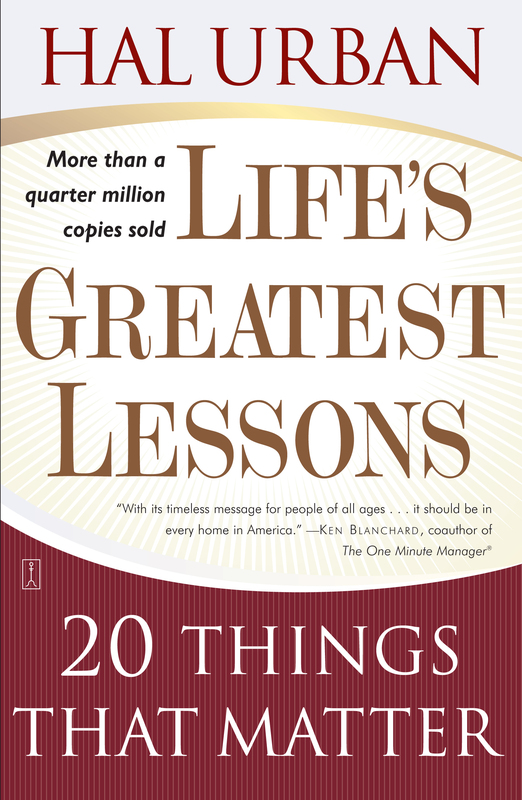 With more than a quarter million copies sold, award-winning teacher Hal Urban outlines twenty lessons that answer timeless questions about how to make the most of your life. Life’s Greatest Lessons is a wise, wonderful book. In it, Hal Urban, a parent and an award-winning teacher, presents twenty principles that are as deeply rooted in common sense as they are in compassion. The topics, gathered from a lifetime of teaching both children and adults, span a wide range of readily understood concepts, including attitudes about money, understanding the real meaning of “success,” and the importance of having fun. The book will help you find the best—in the world, in others, and in yourself. Classic in its simplicity and enduring in its appeal, Life’s Greatest Lessons helps us all rediscover that the desire to live a good life is timeless. Success means doing the best we can with what we have. Success is in the doing, not the getting -- in the trying, not the triumph. I was thirty-nine when I first understood what it meant to be successful. What did I do? Become the CEO of a Fortune 500 company? Drive home in my first Mercedes? Win the lottery? Take home the grand prize on Who Wants to Be a Millionaire? None of the above. I just made a simple, yet profound, discovery. I discovered how life works and what its essentials are. After years of missing the point, I began to understand what it means to succeed in life and how to go about it. With this discovery came two things that had always eluded me: a sense of inner peace and a feeling of self-worth. And best of all, I began to enjoy life more than ever before. So what was this great discovery? Is there really a formula for becoming successful? I'm convinced that there is. But you won't find it wrapped up in a nice, neat package and advertised on TV. It's not new, it's not a secret, and there's nothing magical about it. Therefore, it won't sell. It's too old, too simple, and too innocent. But it works. After years of studying history, philosophy, and psychology, I realized that life and success can be reduced to some fundamental principles that have been around for thousands of years. After following several different paths in search of "the good life," I ended up back where I'd started, and with what I now call old-fashioned truths. As Edward Albee says in his play The Zoo Story, "...sometimes it's necessary to go a long distance out of the way in order to come back a short distance correctly." Does this book contain the formula? Will you find it within the "20 Things"? I hope so. I honestly believe that if you apply these age-old principles consistently, you'll both understand and experience the true meaning of success. A Swedish proverb tells us that we get old too quick and smart too late. Maybe that doesn't have to happen. Maybe my book will help you get smart earlier than I did. And even if you're older, it's never too late to learn. The smartest people in the world are the ones who know how to be happy. We can't seem to make up our minds whether money is good or bad. When someone is described as successful, it usually means he or she is wealthy. So it must be good. But they say money can't buy happiness. So it must be bad. Wealthy people contribute billions of dollars each year to worthy causes. So, it's good. But haven't we heard that money is the root of all evil? Now it's bad again. People who aren't rich criticize those who are, but would love to be rich themselves. So, which is it, good or bad? Does it really say in the Bible that money is the root of all evil? No. It says the love of money is the root of all evil. That's quite a difference. There's nothing wrong with money. There's nothing wrong with wanting it, and there's nothing wrong with having it, even in large amounts. The keys are how we earn it and what we do with it. Honestly acquired and well spent, money can be a resource for much good. Can it buy happiness? Whoever said that it can't probably didn't have enough. Actually, it'll buy a lot more happiness than poverty will. I think Pearl Bailey best described it when she said, "Honey, I been poor, and I been rich. And let me tell you, rich is better." It probably is better in most cases. There's nothing illegal or immoral about being rich, but it isn't everything. During the 1980s, we constantly read and heard about how many people were becoming millionaires...and how many millionaires were becoming billionaires. Some of the most celebrated among them went to prison. Ivan Boesky, one of the financial wizards of the day, even went so far as to say, "Greed is good." He said it a few months before being indicted by a federal grand jury. He was willing to say in public what many were feeling in private: success and wealth are synonymous. Now we look back on the quest for wealth in the 1980s as being somewhat mild. That was just a warm-up for the dot-com and stock-market meteors of the 1990s. We learned on an almost daily basis who the new "instant billionaires" were, and countless people were risking their health, relationships, and resources to join the ranks. And all too often, ethics and some of our most cherished values took a backseat to wealth and the accompanying lifestyle. The corporate scandals, still unfolding as I write -- at Enron, Arthur Andersen, Tyco, Xerox, WorldCom, and others -- are perfect examples. At Enron, for instance, the company and its executives were on top of the world. But they were toppled because of the way they got there. Their empire now lies in ruins. And because of what Newsweek magazine called "executive avarice" and the "greedy, go-for-broke ethos" of the corporate world, thousands of innocent employees and investors lost their jobs and much of their life savings. This is what happens when we lose perspective on money. Life gets distorted. It wasn't just those who went to prison in the 1980s or went bankrupt in the 1990s and the early 2000s who lost themselves in the pursuit of the almighty dollar. Many of those who made large amounts of money legally and managed to hold on to it were still coming up empty. The Tom Peters Group conducted extensive interviews with thousands of business executives during this period. Almost half of them said that despite years spent striving to achieve their financial goals, their lives seemed "empty and meaningless." Sixty-eight percent of the senior executives interviewed said they had neglected their family lives to pursue professional goals. These are people who had money, property, power, and status. Why weren't they happy? Because having those things is not the same as being successful. They'd lost sight of what was essential. They got addicted, becoming slaves to big money and the things that go with it. In the process, they damaged their own lives as well as the lives of others. Success is more than making money. To overemphasize its importance is to cheat ourselves out of the other things that make life so much more interesting, meaningful, and rewarding. The great philosopher Thomas Carlyle once wrote, "Let each become all that he was created capable of being." I can't think of a better definition of success. Life challenges us every day to develop our capabilities to the fullest. We're successful when we reach for the highest that's within us -- when we give the best we have. • Successful people accept life as it is, with all its difficulties and challenges. They adapt to it rather than complain about it. They accept responsibility for their own lives instead of blaming or making excuses. They say YES to life in spite of its negative elements and make the most of it, no matter what the circumstances. • Successful people develop and maintain a positive attitude toward life. They look for good in others and in the world, and usually seem to find it. They see life as a series of opportunities and possibilities, and always explore them. • Successful people build good relationships. They're sensitive to the needs and feelings of others. They're considerate and respectful. They have a way of bringing out the best in other people. • Successful people have a sense of direction and purpose -- they know where they're going. They set goals, accomplish them, and then set new goals. They accept and enjoy challenges. • Successful people have a strong desire to learn: about life, the world, and themselves. They see learning as a joy, not a duty. They continually enrich their lives by learning new things and improving themselves. They are always discovering, always growing. • Successful people are action-oriented. They get things done because they're not afraid of hard work, and they don't waste time. They use it in constructive ways. They don't get into ruts or become bored because they're too busy looking for new experiences. • Successful people maintain high standards in their personal conduct. They know that honesty is one of the main ingredients in the character of a good person. They are consistently truthful in both their private and public lives. • Successful people understand the difference between existing and living, and always choose the latter. They get the most out of life because they put the most into it. They reap what they sow. And they enjoy life to the fullest. In our society today, large numbers of...people never fulfill their potentialities. Their environment may not stimulate such fulfillment, or it may actually stunt growth....Our strength, creativity, and growth as a society depend upon our capacity to develop the talents and potentialities of our people. I kept this quote posted in large letters in my classroom for many years. It served as a reminder for both me and my students that there's more of us to be realized. John Gardner was a former secretary of Health, Education and Welfare, the founder of Common Cause, and the author of several books. He wrote in Excellence that too many of us never fully develop because of influences in our environment. I agree. We simply get blitzed with too many messages that don't have anything to do with real success. We're urged to look for the quick fix rather than to look inside at our own resources. If we don't look, we don't find, and our capabilities remain hidden. We end up seeing limitations instead of possibilities. The good news is that the best season of your life can be ahead of you no matter what your age or circumstances -- if you choose to make it so -- because 90 percent of your potential is not only untapped and unused, but also undiscovered. That's not just good news, it's incredible news! Tim Hansel is an adventurer, speaker, author of six books, and a man who daily squeezes everything he can out of life. He's also a former colleague and a dear friend. When we taught a psychology class together several years ago, we constantly urged our students to look inside -- to discover what was good about them and to recognize how much potential they had. We encouraged them to be more and do more. Surprise! They were eighteen years old and had never heard things like that before. About a year later, I began to issue the same challenge to my students at the University of San Francisco. Most of them were in their thirties and forties, some older. Guess what? They'd never been taught anything about their potential, either. At the end of a great class discussion on it one evening, a forty-seven-year-old woman seemed to sum things up when she said, "You know, you're right. We spend too much of our time just going through the motions. We don't seem to realize our potential." But as Tim reminds us in his quote, it's good news that so much of us is still undiscovered. That's one of the main messages in this book. Whether we're young or old, whether we have a ninth-grade education or a Ph.D., we can always learn more about our potential for becoming the persons we were meant to be. If we look inside, we'll find all the resources we need for real success. I was a teacher for thirty-five years and loved virtually every minute of it. I had the best of all worlds -- I taught kids in a public high school, adults in a Jesuit university, and spoke often to children at the elementary- and middle-school levels. I discovered long ago that regardless of age, people are eager to learn when it means understanding life more deeply and living it more fully. The letters and e-mails I receive from young children, teenagers, and adults confirm this on an almost daily basis. Saint Ignatius Loyola, one of the world's greatest educators, once said that we only learn when we're ready to learn. In my lifetime, I've never experienced a period like the present in which so many people are not only open to learning, but also to re-examining their values and priorities. After enjoying a sustained period of unprecedented technological and economic advancements, our world has been shaken. The "dot-com" phenomenon imploded; the stock market and the economy took a nose dive; the events of September 11, 2001, both grieved us and reminded us of our vulnerability; and the corporate scandals of 2002 further shocked and dismayed us. As one who's studied and taught history for many years, I know that tough times ultimately bring out the best in us. When people start asking questions about what's really important, they usually find the right answers. I'm pleased and honored that my book is helping the process. Our schools, for the most part, do a great job. From first grade through graduate school, they offer a multitude of courses which result in increased knowledge and valuable skills. But there's something missing in the curriculum. We don't teach our students about life itself, about how it works or about what's essential. Never has there been a greater need for that. We need someplace other than the proverbial "school of hard knocks" to acquire the right tools for succeeding in life. We need help in developing the attitudes and skills necessary to establish satisfying relationships, to set and achieve personal goals, and to enjoy feelings of self-worth. As an educator, I felt this need for many years. But my pleas fell on deaf ears. Administrators were more concerned with test scores and budgets. Helping our students develop into good human beings didn't seem to be the school's responsibility. So I wrote this book to fill a void, to help us and our kids understand what's important, what good character is, and what it means to be successful in life. A few years ago, while attending a conference, I heard a psychologist say that by the time a person reaches the age of eighteen, he or she has been put down more than a hundred thousand times. I don't know how he came up with that figure, but it wasn't surprising. The truth is: we do get put down too much. It starts at an early age, comes from a variety of sources, and continues well into adulthood. In addition, the news media tells us every day what's wrong with the world and its people. This daily barrage of negatives takes its toll. The more frequently we hear something, the more likely we are to believe it. It's not my purpose to examine why this happens, but simply to point out that it's one of the unfortunate truths about life. I wrote this book because I think we need help in focusing on the other side of humanity. I happen to believe that the overwhelming majority of people in the world are law-abiding, loving, and caring. They just don't get any publicity for it. Being good doesn't make the news. I also believe that most of us sell ourselves short. We have good qualities we're unaware of, have inner resources we haven't discovered, and have opportunities we never dreamed of. I hope this book brings out some positives in a world that seems to dwell on negatives. Finding the good in life can be one of our greatest joys. About a year before I wrote the first draft of this book, I gave a talk called "The Real Meaning of Success" to a group of college students. I began by pointing out some of the messages we get bombarded with constantly. I wanted them to know that my message would be quite the opposite. So I started by telling them what I didn't have: I had no "secrets" of success, no "magic formula" for complete happiness, no "amazing new techniques" for attaining the American Dream, no "quick and easy" way to become rich and powerful, and no "unique" method for getting everything we want. Instead, I spoke that day about such time-honored values as respect, kindness, honesty, appreciation, desire, hard work, commitment, and just being a good person. My point was that there's no shortcut, no easy way, and no new method for achieving real success. It still has to be earned. I was both surprised and pleased that so many of them stayed afterward. One of them said, "You know, you didn't really say anything I hadn't heard before, but you put it together in such a way that it made more sense. You really shed new light on some old truths." Then an elderly faculty member who was standing nearby said, "Thanks. We all need to be reminded about what's really important." Here were a young man just starting college and an older man nearing the end of his career telling me the same thing. Boy, did I love those two! They helped me decide that I had to write this book. Rabbi Harold Kushner author of When Bad Things Happen to Good People A wise and wonderful book. It will enrich anyone who reads it. Ken Blanchard coauthor, The One Minute Manager and Whale Done! With its timeless message for people of all ages, this book is going to become a classic. It should be in every home in America. Stephen R. Covey author of The 7 Habits of Highly Effective People A tremendously enriching book full of classic wisdom to live by. Mel Levine, M.D. author of A Mind at a Time This book can help all of us assemble our priorities. Thomas Lickona author of Educating for Character A great book about character for kids, teachers, and parents! Laurie Beth Jones author of Jesus, CEO; The Path; and Teach Your Team to Fish Hal Urban has put into bite-size pieces some of life's most important truths. Read, learn, and enjoy! 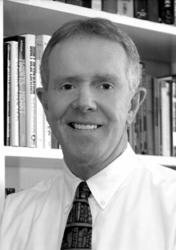 Pat Croce author of I Feel Great and You Will Too! and 110% Life's Greatest Lessons helps to unlock your mind to a treasure chest of life's opportunities and possibilities.